Dedicated to goddess Goddess Parvati (Meenakshi) and her husband Lord Shiva, many visit Mudarai just to see Meenakshi Amman Temple. There are four towers or 'Gopurams' that taper inwards toward the sky. Each tower is decorated with a thousand painted sculptures. Baskets of coconuts, bananas and incense are available to buy. Devotees line up to perform darshan. Non- Hindus are not allowed in the inner sanctum. 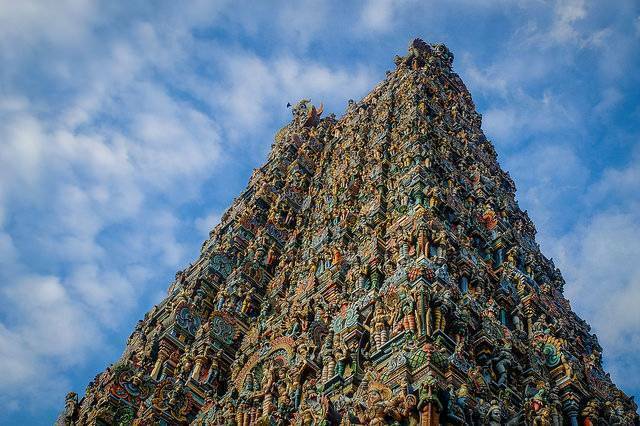 Meenakshi temple is spread over 16 acres and you can hire a guide if you have an architectural inclination, but beware of ‘guides’ who try to lure you into nearby shops. There is a market of flowers, spices and handicrafts surrounding the temple. Best time to visit the temple is in the mornings. Main attraction of the temple are its golden lotus pond, long corridors inside the temple and gopurams, temple museum and the thousand pillar hall. You wont be allowed inside the temple if you are wearing shorts. Avoid visiting the temple during festivals and religious ceremonies as the temple complex becomes sea of people.